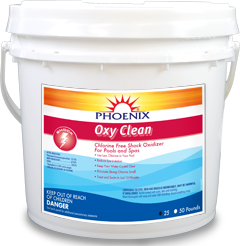 Phoenix Oxy-Clean - Phoenix Products Co.Phoenix Products Co.
Is a non-chlorine granular shock treatment that removes organic waste, destroys chloramines, improves water clarity, and can remove the contaminants that can cause cloudy water and that strong "chlorine" odor. 1 LB treats 10,000 gallons. Available In 2LB, 5LB, 25LB and 50LB.